One of my favorite things to do with the kids is making learning fun. I always promised myself that when I had kids of my own, I wouldn’t be their teacher like in a classroom. I would be their mom first. But that doesn’t stop us from doing fun things like letter of the week crafts! For the next 26 weeks or so, I’ll be sharing a letter of the week craft each Monday morning! And we’re kicking off with the first letter of the alphabet! For this craft, I recommend that you pre-cut all of the shapes for your child. If you have an older child they might be able to cut themselves. This is a great opportunity to talk about shapes with your child too. Turn the blue sheet of construction paper vertical and use your marker or crayon to draw a large capital A. 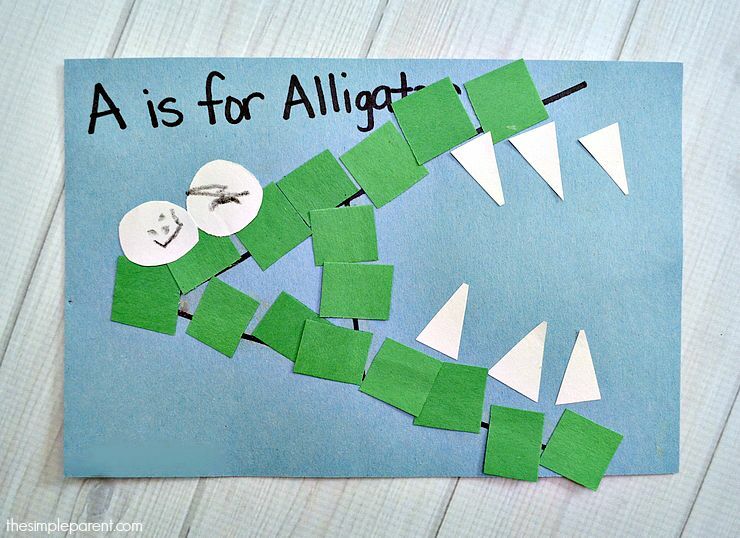 Turn the paper horizontal again and you can write A is for Alligator, if desired. Have your child glue green squares along the black line letter A. 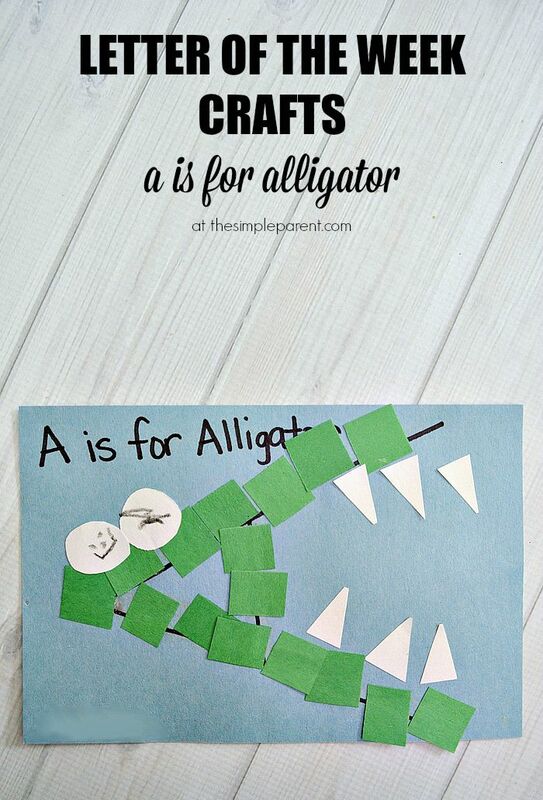 Glue three white triangles to the top leg of the A and three to the bottom to create the teeth in the alligator’s mouth. Draw a black dot on each white circle then glue on top of the other end of the letter A. And once it dries, you’ll have your very own pet alligator! Talking about alligators is a great way to also talk about types of animals and where they live. You can also talk about crocodiles. See if your child knows what letter that word starts with! Some of our favorite alligator books are There’s an Alligator Under My Bed and Lyle, Lyle, Crocodile.